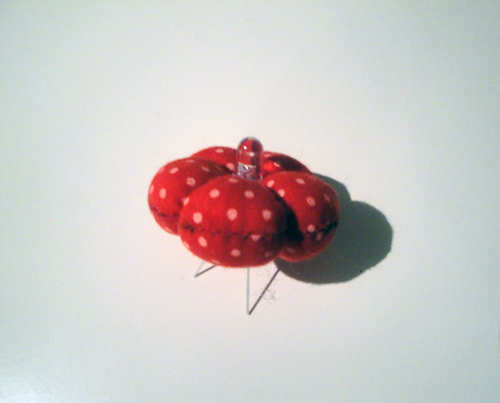 Isabel and I designed this as a soft circuits exercise for some upcoming materials workshops. 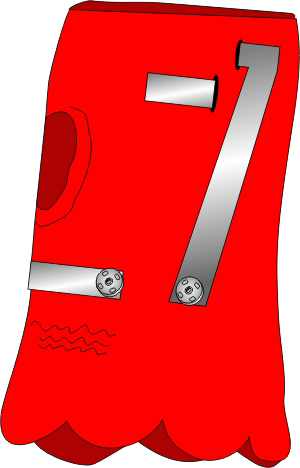 Below you can find all the instructions and images we prepared for this purpose. Note :: The measurements on this tutorial are for very small hands – mine :) Remember to adjust them to your glove size. 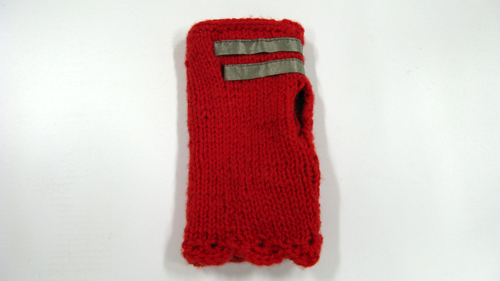 Also, we used iron-on conductive fabric on our first prototype, but after some wear it started to come off, so we ended up sewing all the conductive fabric to the knitted glove. 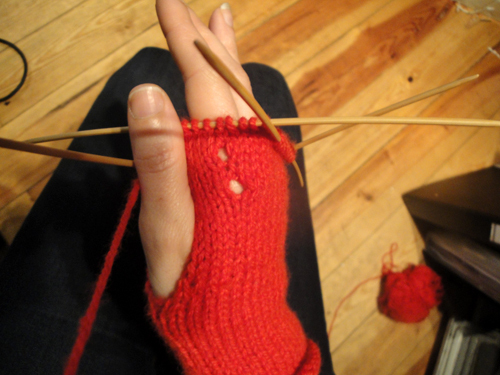 If your knitting skills aren’t as good as Isabel’s you can use any store-bought mitten/glove and skip this step. On a hand shake the best point of contact usually happens in between the thumb and the index. But we thought it would be fun to also make it work for high fives so we extended the fabric contact strips all the way across the palm. Cut two strips of conductive fabric approximately 0.5cm (0.2in) wide. One should be around 28cm (11in) long and the other 15cm (6in) – adjust to your glove size. Cut two vertical slits on the top side of your glove and stitch them so the glove doesn’t come undone. Do the same on the palm side. The distance in between the top and palm slits should be approximately 7cm (2.75in). Slide the longer strip of conductive fabric in between the two slits closest to the fingers. On the inside leave an 11cm (4.3) tip on the palm side and 10cm (4in) on the top side. Do the same with the second conductive fabric strip and slide it in between the other two slits, leaving 2cm (1in) on the palm side and 6cm (2.4in) on the top side. Sew the fabric strips in place. This double pouch will contain the two 3V coin cell batteries. They should fit very snugly to ensure proper contact. Cut a piece of non-conductive cotton fabric of approximately 9cm (3.6in) x 6cm (2.4in). Hem the top and bottom on the longest side: one hem should be 1cm (0.4in) high and the other 0.5cm (0.2in). Fold your piece of fabric over itself so that the 1cm (0.4in) hem sticks out. Crease the fold with the iron. Next, open your square of fabric and iron on 3 strips of conductive fabric as shown on the image. Use conductive thread to sew on two snap studs at the tip of the 2 parallel strips (on the 1cm/0.4in hem). 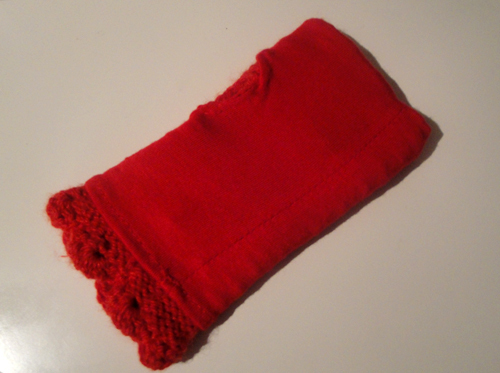 Now, fold your piece of fabric back down and, using non-conductive thread, sew the left and right sides of your pouch. Turn it right side out and stitch across the middle to make two compartments. The batteries should fit very snugly inside these compartments so make them as tight as possible. Turn it around so the snaps are facing down, and using a marker write “+” on the right side and “-” on the left. 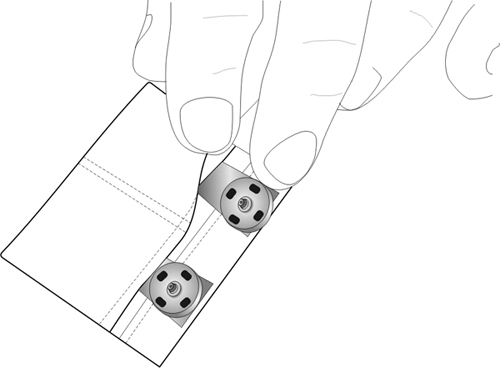 With your glove inside out, fold and sew the longer conductive strip as shown above. Using conductive thread, sew a snap socket at the tip of the longest strip of fabric. Cut another strip of conductive fabric approximately 5cm (2in) long. Place it so the its tip matches the position of the batteries pouch and extends horizontally all the way into the palm side of the glove. 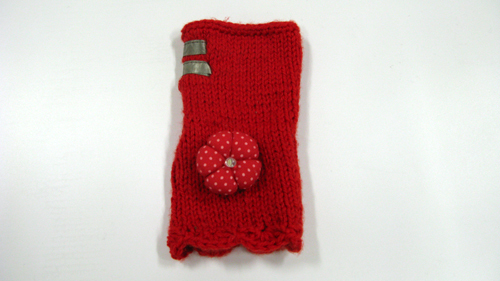 Sew it to the glove and attach the second snap socket using conductive thread. Insert the LED on the flower so that its legs stick out from the bottom. Make sure the legs of the LED aren’t touching each other. the LED is represented above as being inside the glove just so you can see where to place it, but in fact it should be embedded on the flower on the exterior, only its legs should extend into the interior. 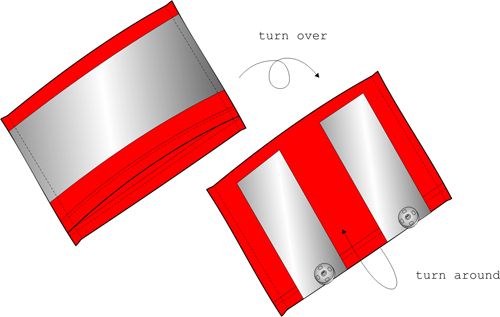 With the glove inside out, fold and sew the conductive fabric strips as shown above. 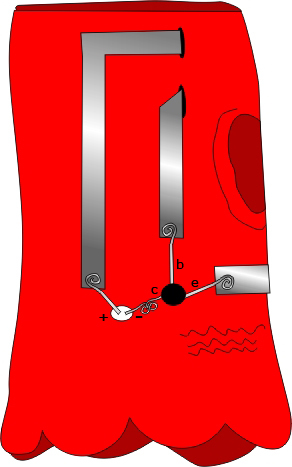 Open the legs of the transistor and curl them slightly with needle-nose pliers. Using conductive thread, sew the emitter of the transistor to the horizontal strip and the base to the vertical strip on the right. 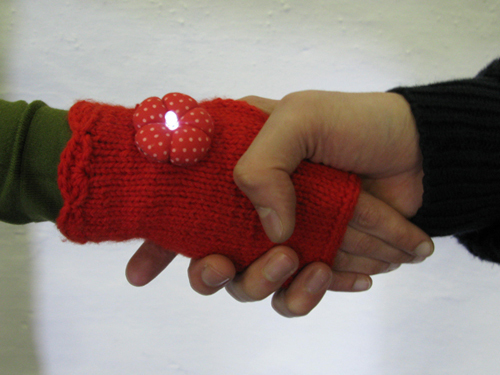 Place the flower on the exterior side of glove so that the shorter leg of the LED (-) is closest to the transistor’s collector and sew them together using conductive thread. The transistor’s legs break easily, so avoid stretching them too much and add a tiny drop of super glue to the junction area. Sew the other leg (+) of the LED, with conductive thread, to the left vertical strip of conductive fabric. This is absolutely necessary since it not only makes the glove more comfortable, but also avoids contact between your skin and the exposed circuit (which would cause the LED to be always on). Use any non-conductive stretchy fabric and sew it to the glove only at the top (near the fingers slit). This will avoid contact between your hand and the circuit while still allowing you access to it. Insert the batteries into the pouch. The one on the right should have + facing up and the one on the left the other way around. 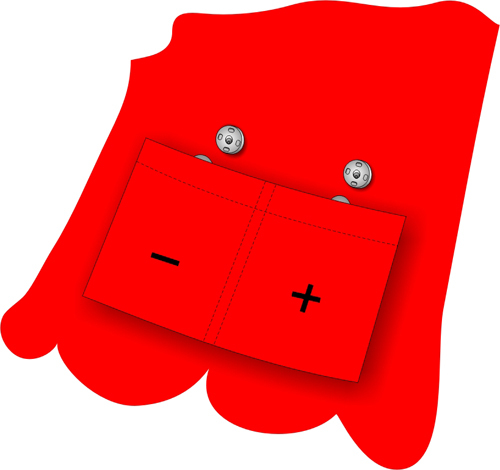 Use the snaps to attach the pouch to the glove.